40” twill lab coat, white, 65/35 poly cotton, embroidered with 100+ years logo and Inspiring Quality tagline. Features 2 roomy lower pockets, 1 left chest pocket, side access vents, and 5 button-front closures. Member Price: $40.00 (includes domestic USA shipping only). For international orders and shipping charges, please call ACS Customer Service at 312-202-5474. The RAS-ACS Fleece Jacket is a lightweight, 100% polyknit fleece full-zip jacket with zippered pockets. The jacket has a brushed inside for warmth and softness. The RAS-ACS logo is embroidered on the left chest. Member and Associate Fellow Price: $50.00 (includes domestic USA shipping only). For international orders and shipping charges, please call ACS Customer Service at 312-202-5474. Surgical cap with blue ACS logo and Inspiring qualities tagline. Member Price: $10.00 (includes domestic USA shipping only). For international orders and shipping charges, please call ACS Customer Service at 312-202-5474. Save a life and be part of the Stop the Bleed initiative by wearing a Stop the Bleed t-shirt. These Stop the Bleed red long sleeve t-shirts provide valuable information in what to do in the event of a bleeding emergency. T-shirts are available in sizes SMALL to 3XL and are made from ring-spun cotton. Be fashionable and Save a life! Member Price: $21 (includes domestic USA shipping only). For international orders and shipping charges, please call ACS Customer Service at 312-202-5474. Save a life and be fashionable. 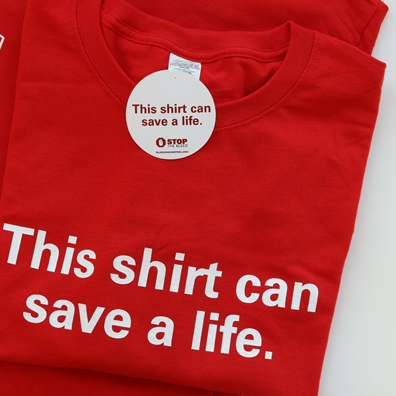 These bold red t-shirts help spread the word about what to do in a bleeding emergency. Shirts are available in sizes small through 4X, and are made of 100% pre-shrunk, combed, ring-spun cotton.